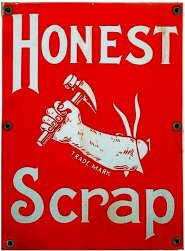 …supposed to tell you 10 HONEST things about myself and then nominate 7 other blogs that I think deserve to receive the Honest Scrap Award. Though I’ve only been married for three years and we have no kids, for some reason, my wife and I drive a minivan. Its more out a circumstance than choice. We spent our first year living in Chicago and didn’t need a car. But then when we moved to Texas, we were given this van. It’s been great for moving across the continent, which we’ve now done twice, but it would definitely not be the first choice for either of us. I don’t own a TV and never have. The few movies we watch, we watch on the computer screen. I grew up in the country: Northern Minnesota, up in the woods. I love the outdoors. But I also love the big city, after living downtown Chicago for four years. Its all the stuff in the middle – suburbia – that I can’t stand. I’ve been waiting for more than a year for my Canadian citizenship to be recognized officially. In our household (apartment-hold? ), I do just about as much of the cooking as my wife. We eat homemade Chicago style deep dish pizza at least once a week, as well as homemade salsa at least once a week. People in our church think that we’re some sort of natural living, vegetarians or something because we make so much of our own food from scratch, do most of our household cleaning without harmful chemicals, and don’t own a TV. But the truth is that we’re just cheap. Why buy expensive stuff when vinegar, hot water, and dish soap will do the trick? I get tired of politics very quickly. I always feel as if one side is complaining because “the other side” is doing the exact same terrible things that they were doing when they were in power. I like old movies and old TV shows. I have all six seasons of Hogan’s Heroes. I really like books – but you already knew that. Now, who should I tag… I’m not sure that I can tag seven. This has been around quite a bit already. I think Rick is tired of Memes, but I don’t think I can get to 7 other wise at http://www.supakoo.com/rick/ricoblog/ (just don’t feel obligated). I’m not sure Calvinism logically requires either perspective on gender. Historically . . . Historically, yes, but that’s how the theological landscape has been forming over the past five years or so. Life without TV is possible. I have never owned one, stopped watching TV after the 1968 Demo Convention in Chicago. The same summer I read Understanding Media by Marshall McLuhan, a book which had some influence. Perhaps the reason we have time to do greek is because we don’t waste time being addicted to entrainment. I went to a college where TV’s weren’t allowed in the dorm rooms. It was there that I realized I had plenty to do anyway and didn’t need it. The usual crop of mispellings and other errors. Hard to read this type on a 24inch monitor. Its okay, I have trouble seeing them on this 16″ monitor.